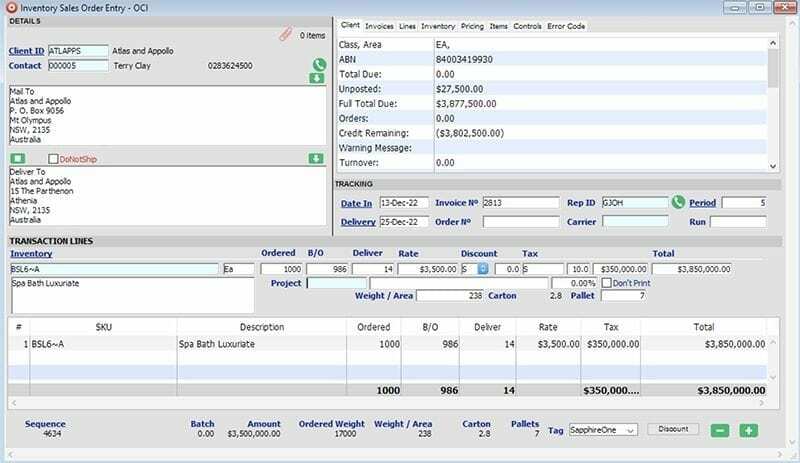 The SapphireOne sales menu allows you to create a client quote, that can be converted to a client order, that can be subsequently converted to a picking slip, packing slip and client invoice. Once verified, this transaction is posted to dynamically create a client accounting entry. Quotes, order and invoices can also be entered independently. SapphireOne also offers the back-to-back feature, which will automatically create a vendor order, from linked inventory items when a client quote is converted to a client order. In the transaction area the Margin, Markup and GP fields can all be utilised on this line allowing any price negotiation to be calculated on individual items and checked against the cost price immediately. The quote also displays the availability status of the item, either in stock or on back order, and the number of items in each. There are no Periods on Orders as they are held in the current period until converted to Invoices. At the end of the month, the system will re-write the period so all orders in the system remain in the current month or period. The order enables you to enter a Project ID. This will identify a project for which the goods are being purchased, hence can be used for each separate item order to link them to the common project. There is an area for personalised descriptive text which will be printed on the first page of the Invoice, and an area for instructions. There is also an area for in-house comments that will not print on the invoice. By default, the system will print everything; however, the user can select any combination of what not to print, while still having all of the information in a soft copy. There are four Inquiry screens that allow you to search and access your main Client files. These are: Transactions, Transactions lines, Sales People and Clients. This detailed form provides a record that is simple to search for specific transactions. From this window, you can Modify, Manipulate and Find from the Options menu of the information stored in your transactions. The user can re-sort by selecting any column header and manipulate information by highlighting and using the functions from the Options menu or Tools icon. It has optional Invoice Lines for further features of the completed order and any extra details taken from the Client Invoice’s More Details Page. There are many report options, all for different uses. For example, a One Line Invoice details the Header Line of the Invoice and is used for Invoice value reports. There is also Sales Allocation, detailing payments from individual client accounts, and Inventory Checks which is a report showing stock levels per Invoice. This function is identical to the Client Inquiry in Accounts mode. The initial Client Inquiry screen presents a window that contains a list displaying some of the basic details about each client. This will allow you to easily select the required client for additional viewing or modifying. In other areas of the SapphireOne program, whilst entering data you may alter client details which are created by the default setting here and they will not become a permanent part of the default client record. ANY alterations you make here will become a permanent part of the client’s record and will then be used in any future transactions of any type for the client. This screen enables the management of goods that have to be delivered. Transactions processed through this screen will automatically be converted to Sales Client Invoices (SCI’s) for the goods delivered. If any items are not 100% delivered, the Order Client Invoices (OCI’s) will automatically update accordingly, until all goods listed are completely delivered. Users should also be aware that by default, if the system calculates that it has the complete number of stock as ordered, it will offer to fully deliver all stock as originally ordered. If this is not required for any order the user simply needs to highlight the particular order, select the modify button and manually alter either the number to be delivered or the number to be placed back on back order. SapphireOne provides your business with a powerful quotation management system. Automatically generate and track your quotes, tailor quotes to meet specific Client Rates and quote for various Tax Rates and Pricing Structures. Instantly check your Client Information Summary for client sales history and add vendor details for a seamless order process. 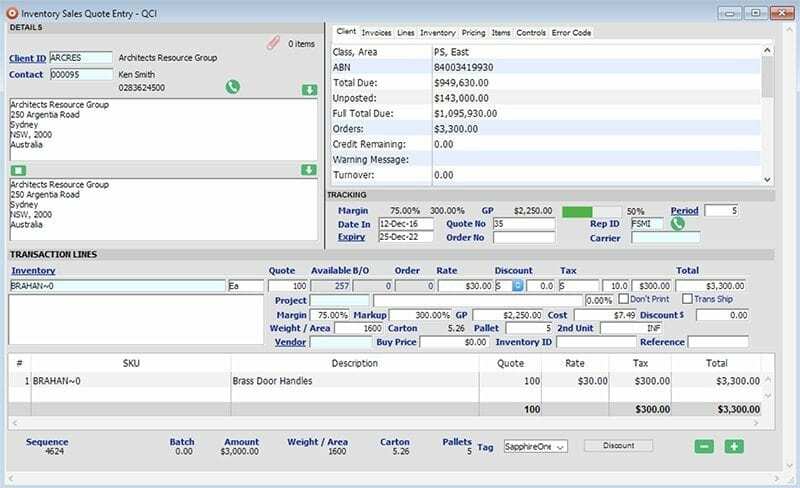 Allow client quotes to process orders or invoices at the click of a button. The SapphireOne Client Order Management system allows the user to generate and track client orders and turn these orders into invoices at the click of a button. Orders can be linked to a Clients Price Book so to tailor an order to meet specific tax and pricing structures required for an individual client. Access the Client Information Summary to instantly check a client’s credit limit, terms and sales history. Produce shipping manifests to track the delivery of your sales. Integrated POS system for retail sales. Stock levels are in real time as the POS system is linked directly to your live Inventory data file. Barcode scan or manually enter your sales items for transactions. Show photos of items allocated to transactions to help with visual verification for staff. Easily allocate % or $ discounts to selected items. Allow for various payment types (ie. cash, cheque, eft, credit card) to be allocated to transactions. Reconcile your day end transactions to check your float and post directly back to SapphireOne financials. Process the return of goods at the click of a button. The returns function within SapphireOne allows the user to easily link the return of goods to invoices so to help reduce data entry tasks. Instantly add client details and link address fields to an invoice with SapphireOne’s Automated Data Entry System. Easily add sales items, or more specific serial or batch inventory items, to an invoice with the Inventory Look-up function. Use the Interactive Calendar to set a future delivery date for a client invoice and link the invoice to a Client Price Book so to tailor a Client Invoice to meet specific tax and pricing structures. Assign invoices to be charged out for specific Job Projects to streamline your Project Management strategies. Include special instructions, terms, internal memos and discounts to be entered for individual client invoices, as well as set your own company specific Invoice Layouts. Produce detailed shipping manifests to track the delivery of your sales. Enable your company to manage inventory items that have been delivered. Transactions processed through this function of SapphireOne will be automatically converted to Sales Client Invoices for the goods delivered and undelivered items will be updated to the Client Orders. Track back orders and have the ability to load all orders or only ones that already have picking slips printed. The back order feature also allows you to split orders, so when only part of an order has arrived, it can be immediately released if requested so by clients. Quickly access contacts, shipping details, terms, overdue invoices and past transactions for clients in either the Quote, Order or Invoice stages of a transaction. Easily access the sales history of clients through the Client Inquiry function of SapphireOne and view this data as both line items and graphically to help with Client Sales Analysis. Access all current and historical (posted) transactions for a client through the Client Inquiry function. Set up a client Price Book to automatically update a special inventory sales price for a specific client when invoiced.Access all current and historical (posted) transactions for a client through the Client Inquiry function. The Transaction Inquiry screen presents a window that contains all the current Quotes, Orders and Invoices entered through the Sales Menu. Users can use this inquiry screen to pick transactions to be modified, viewed or printed in a variety of different report types. Add or modify sales people to allocate specific controls that they may have over inventory. Assess the performance of your sales staff by easily checking month-to-date and total-to-date sales information. Allocate or check the actions of your sales staff with the SapphireOne Action function. The Transaction Line Inquiry Screen (Sales Line Inquiry) displays a complete list of the line items entered in the Invoice Transaction screens. Selecting a Line Item from this inquiry screen will give the user a more detailed look at the transaction that this item is related to. All Sales Lines are listed allowing you to obtain a fully-detailed report on all sales lines (ie. Sales Line, Margin Analysis, Mark-up Analysis, Allocation Analysis and a variety of Total and Detailed reports). Produce reports based on the Invoices that have been produced from the Inventory file. The different types give you different levels of report. By making a selection from the four drop down menus of Print Destination, Report Type, Report Sort Order and Report Selection various types of reports can be prepared. Produce a variety of different styles of Order Reports for clients. Some of the more common types used include those linked to the Packing Slip, Picking, Packing & Picking and Invoice. Produce a report on all the invoices currently in the system for clients. SapphireOne allows for a variety of report types and Report Sort Orders to be selected in the Invoice Reporting option of the application.